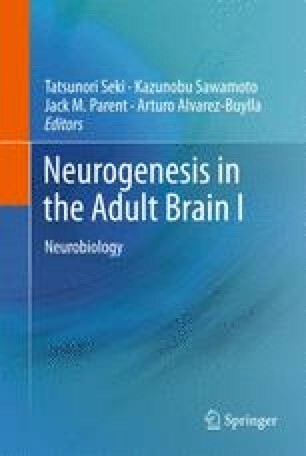 Adult neurogenesis in the brain of teleost fish has been studied since the 1960s. These investigations have demonstrated mitotic activity in dozens of brain areas and relative rates of cell proliferation 10–100 times higher than in the adult mammalian brain. The source of the new cells are stem cells in distinct ­proliferation zones, which give rise to both neurons and glial cells. Depending on the brain region, the young cells either reside in close vicinity to the proliferation zone from which they originate, or they migrate long distance to specific target areas. During migration, they are guided by radial glial fibers. Approximately half the young cells undergo apoptotic cell death within the first few weeks of their life; the other half persist long term. This continuous addition of new cells to the population of older cells leads to a permanent growth of the brain. A major function of adult neurogenesis in teleosts appears to be to ensure numerical matching of neurons in the central nervous system and sensory receptors cells or muscle fibers in the periphery. Neurogenesis also plays a central role in brain repair by replacing cells lost to injury by newly generated ones. Large-scale identification of regeneration-associated proteins by proteome analysis has revealed cytoskeletal proteins essential for the formation of new cells, proteins involved in cell proliferation, cellular motility, neuroprotection, and energy metabolism, as well as a zinc finger protein that may act as a transcriptional regulator.